Welcome to Dreamworld. A dream released on a beautiful 20-acre land dedicated to fun, food, and frolic. A place where there is always something for everyone. Situated at a lush green inspirational locale only 25 km from Lucknow city on the Lucknow-Kanpur highway. 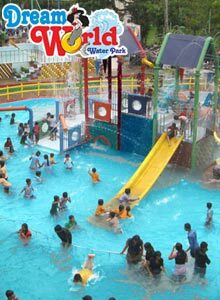 The dream world is home to myriad entertainment facilities including India's first Indoor Water Park, Club, Children's park Hi-Tech Video Game Parlour, Amusement Park, Multi-cuisine Restaurants, Party Lawns, Go-Karting and DJ Hall. With such facilities that would easily pamper you, your kids, family members and friends. Dreamworld gives a new meaning to fun and entertainment. Birthday, Anniversary, weekend outing, throwing a party, escaping from the mundane daily life or just relaxing, any reason is a good reason to visit Dreamworld. One visit here and you will be convinced that there are very few places quite like Dreamworld. Its so easy to enjoy yourselves here but so hard to forget the experience. Activities : Tennis court, Billiards, Water sports facilities (on site), Waterpark. Food & Drink: Restaurant, Room service, Breakfast in the room, Vending machine (drinks). Pool and Wellness: Indoor pool. Time : 10:00 am to 6:00 pm.